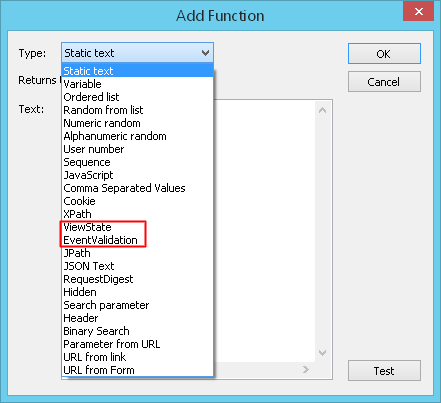 ASP requests usually contain __VIEWSTATE and __EVENTVALIDATION parameters which must be parameterized. For this purpose there are 2 special functions in WAPT: $ViewState and $EventValidation. When you install the Module for ASP.NET Testing on your computer, they appear in the list of WAPT functions. These functions are empty (have no parameters), and you cannot edit them. 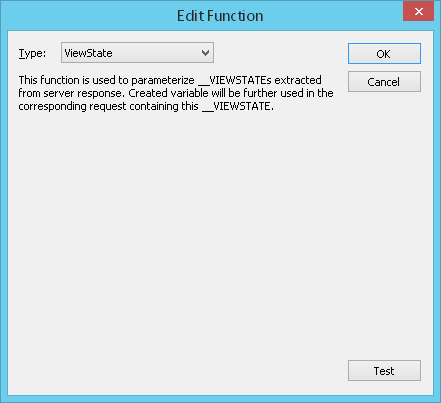 This function is used to parameterize __VIEWSTATE extracted from server response. Created variable will be further used in the corresponding request containing this __VIEWSTATE. 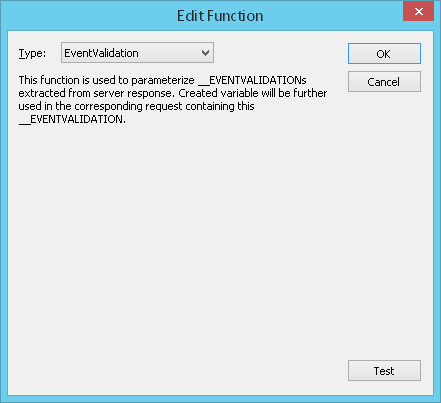 This function is used to parameterize __EVENTVALIDATION extracted from server response. Created variable will be further used in the corresponding request containing this __EVENTVALIDATION. When the module finds a new occurrence of __VIEWSTATE (__EVENTVALIDATION) during recording, it automatically creates AspViewState (AspEventValidation) variable calculated using $ViewState ($EventValidation) function. You can also add such variables manually in the same way as you add any other variables.